Update: We didn’t make it to the circus unfortunately, but a fellow local blogger (and clown!) wrote a very nice three-post series (Part 1, Part 2, Part 3) with many pictures about his visit to the Zoppe Family Circus. Go have a look! I featured another circus a few weeks ago, and we’ll remember that one fondly as our family’s first circus experience. But depending on how the weekend pans out, we may go to the circus again, since Zoppe promises a small intimate circus right within walking distance. Zoppe is a family circus, and its history is a marvelous read: Back in 1842 (no typo), a young clown from France (Napoline Zoppe) fell in love with an equestrian ballerina in Budapest, Hungary, much to the chagrin of the ballerina’s father. A clown just didn’t cut it. The young lovers ran away to Venice Italy and founded the circus. Napoline’s great-grandson Alberto came to the US to work for Ringling Brothers (in exchange for an elephant), and brought the circus over here. 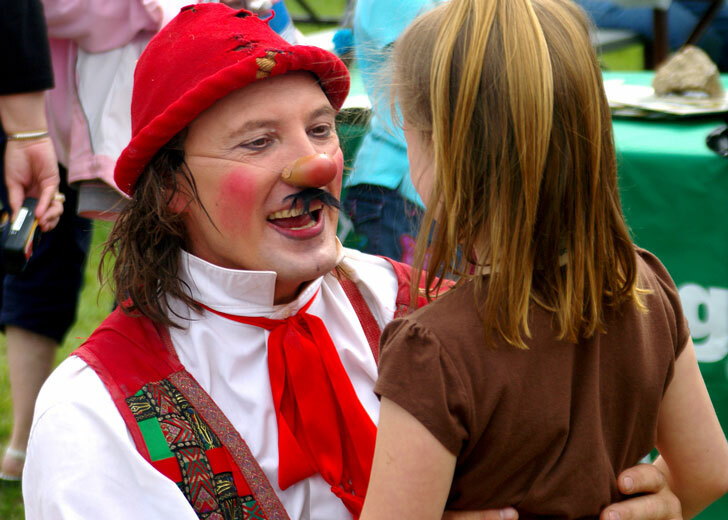 He performed in the circus until recently, well into his 80s, and today the circus is run by his son Giovanni, great-great-grandson of Napoline and pictured above as clown Nino. Zoppe features clowns, acrobats, horses and dancing dogs. They perform Friday – Sunday in front of the Duke Energy Center for Performing Arts. No online tickets – Advance Tickets at the box office or at the door. Image (c) Zoppe Family Circus. This entry was posted in Action, Animals, Circus, History, Music, Raleigh, Stage by daddyweekly. Bookmark the permalink.